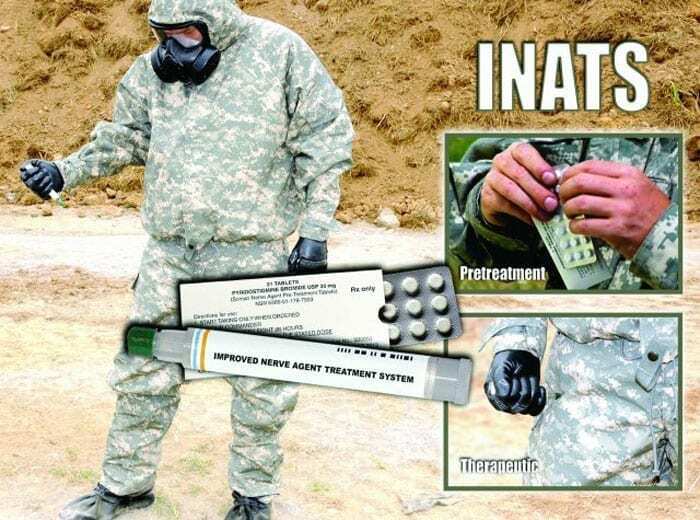 Therapeutic pharmaceuticals against chemical, biological, radiological and nuclear (CBRN) warfare agents are required to support the Joint Forces across a range of military operations. As such, the U.S. Department of Defense (DoD) has a need for developing and fielding systems that provide treatment for exposure to CBRN agents. The DoD is repurposing scopolamine hydrobromide trihydrate as a centrally-acting adjunct therapy that would be administered in conjunction with the Antidote Treatment – Nerve Agent, Auto-Injector (ATNAA) upon exposure of an individual to a nerve agent. Scopolamine readily crosses the blood-brain barrier and acts as a competitive antagonist at muscarinic acetylcholine receptors. It is intended to improve survivability and medical treatment outcomes against the central symptoms of current and emerging nerve agent threats. If the Improved Nerve Agent Treatment System (INATS) – Scopolamine effort is successful, scopolamine will supplement existing medical countermeasures in a single chambered autoinjector similar to the Atropen. One objective of the INATS is to develop an improved nerve agent treatment regimen consisting of a centrally-acting anticholinergic to treat the central symptoms of nerve agent poisoning. A Request for Information (RFI) has been issued for the INATS effort by the Joint Product Manager for Chemical Defense Pharmaceuticals (JPdM CDP) at the Joint Program Executive Office for Chemical and Biological Defense (JPEO CBD) Medical Countermeasures Systems (MCS). All capable providers, particularly members of the CBRN Medical Countermeasures Defense Consortium are encouraged to respond. Respondents not already members of the consortium are encouraged to join at www.medcbrn.org. All written responses must be received by 30 November 2017 11:59 pm Eastern. Further details are available at FedBizOpps Solicitation Number: W15QKN-18-X-00O0.